Friedrich Wilhelm Nietzsche (/?ni?t? ?/; German: [?f?i?d? ?ç ?v?lh?lm ?ni?t?s?? ]; 15 October 1844 – 25 August 1900) was a German philosopher, cultural critic, poet, and Latin and Greek scholar whose work has exerted a profound influence on Western philosophy and modern intellectual history. Beginning his career as a classical philologist before turning to philosophy, he became the youngest-ever occupant of the Chair of Classical Philology at the University of Basel in 1869, at age 24. He resigned in 1879 due to health problems that plagued him most of his life, and he completed much of his core writing in the following decade. In 1889, at age 44, he suffered a collapse and a complete loss of his mental faculties. 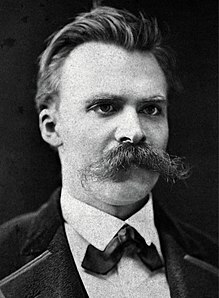 He lived his remaining years in the care of his mother (until her death in 1897) and then his sister Elisabeth Förster-Nietzsche, and died in 1900.